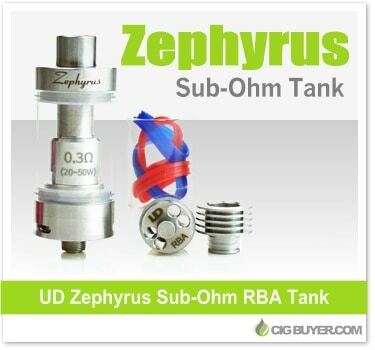 The Zephyrus Sub-Ohm Tank is UD’s (Youde) entry into the sub-ohm market, offering massive airflow and a sophisticated RBA deck. If building coils isn’t your thing and you’d like more simplicity, then it’s 0.3 ohm dual coil head (made with a ceramic base and Japanese organic cotton) will produce outstanding flavor and big vapor. It has plenty of capacity (5ml), incorporates a convenient top-fill design and comes with various colored o-rings (clear, red, and blue) to provide a personal look.